A brand new stage adaption of a magical Australian classic. 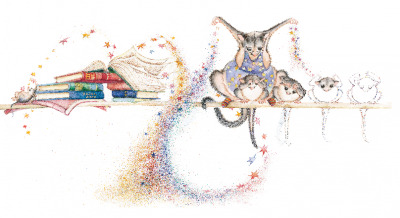 Joined by an extraordinary creative team, Monkey Baa brings to life the characters, journey and love that has made Possum Magic the most-loved and best-selling Australian picture book of all time. Don't miss this amazing show at the Octagon Theatre, UWA. Make the most of your day out by joining in all the FREE activities for little possums and exploring the beautiful UWA campus. This performance is great for patrons aged 3+. Children aged 2 and over will need a ticket to attend this performance. Children aged under 2 do not require a ticket, but will need to sit in an adult's lap for the duration of the show. *AUSLAN Relaxed Performance: Some young people might be easily scared, have a learning disability or just find it hard to follow theatre conventions. They’re especially welcome at 11:30am on Friday 14 June. Lights remain low, loud noises are softened and they can leave and enter at any time. This performance will be AUSLAN interpreted. To ensure you have a suitable seat for this performance, please email info@ticketsWA.com. Get more information on what to expect at a relaxed performance, here.